by When Christians Speak Inc.
Mayra Figueroa-Clark is passionate about propelling individuals towards healthy, Fun and Loving relationships. As a certified Life Coach, Clinical Therapist and Professional Speaker, Mayra seizes every opportunity to help both women and men overcome the challenges that hinder their relationships. 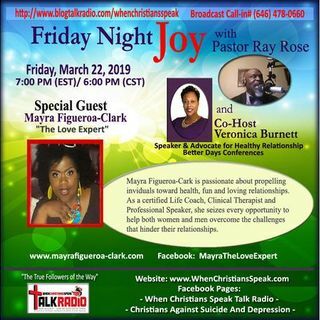 Mayra has been affectionally coined “The Love Expert” and can be found speaking to women about their fears, fumbles and fantasy that hold them back from an authentic relationship. Her straight-talking ... See More approach ignites and inspires! She will help you understand the science of love, communicate effectively with the opposite gender and how to break down those relationship barriers. Mayra helps you experience and express your authentic self, while teaching specific strategies in Living Intentionally, Loving Intentionally and Being Intentional.